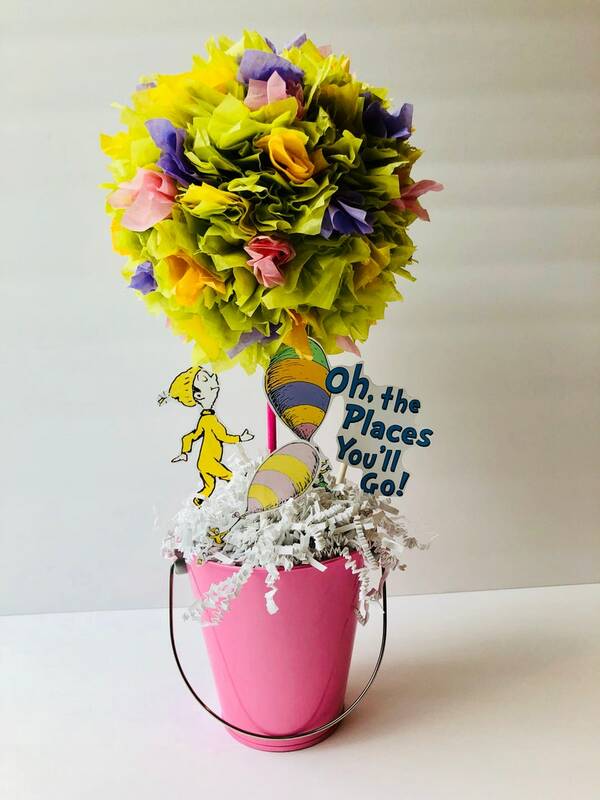 This centerpiece decoration is the Perfect way to bring your Oh the places you’ll go theme together for your party! Everything pictured is included and assembled!! This centerpiece measures approx. 14" Total in height! Different themes and colors available upon request. Contact me with any questions at all! Really cute and shipped quickly. At this time I accept PayPal, ApplePay and Major Credit, Debit and Etsy Gift Cards as my payment method. There are NO taxes on my items. Returns and refunds are not accepted unless otherwise stated in the items description. You may cancel your item order up to full 24 hours from when the item was purchased. Please see my shops refund policy. Items from custom orders and invitations will be shipped at a longer time span, depending on the size and details of the order, contact me for more information. Under certain circumstances a refund or return may be accepted only if the items were 1. Lost in the mail (not received after 4 weeks of being SHIPPED) or 2. If items received were completely wrong items a refund is ONLY given once the item is returned and back in sellers hands ( it is then determined weather or not the items sent were wrong and a refund partial or full may then be given, but not always). Cancelations of orders are only a accepted if the cancelation is made within 24 hours of the order being placed. Refunds, returns and exchanges are NOT accepted for ANY custom orders. Refunds, exchanges, and returns are also NOT accepted if it is past the event/party date specified by buyer in conversation or with orders (this protects me from customers using an item for their party and then returning it). If your products did not arrive in time for your event dates, refunds cannot be given if we shipped out the order with proper postage 4-5 days before event dates stated in messages. We do not take responsibility for postal delays or backups so therefore do not refund orders for any reasons that have to do with postal delays. If you have any questions, please contact us. Thanks so much! Most but not all items are shipped within 1-7 business days after the payment is made and received in full. USPS is normally used for most orders with priority 1-3 day mail. On small items First Class mail might be used. All items on my shop being sold is strictly for the time spent in creating this item. All copyrights and trademarks of the character images being used belong to their respective owners and are not being sold, they are provided to you for free. This item is not a licensed product and I do not claim ownership over the characters used. Does the Tissue Paper Centerpieces come with everything? Yes, the tissue paper Pom Centerpieces come fully assembled and ready to display. How many pieces of cutlery come with the wrapped cutlery sets? If order our wrapped cutlery sets you get it JUST like it’s pictured. Already all wrapped and ready to display and use! You get 10 full complete sets. Example: 10 forks, 10 knifes, 10 spoons and 10 napkins all wrapped together with the pictured themed wrap you choose. Can I get different colors for anything on the shop? Yes! Defiantly! Message me if you are in need of different colors or themes for ANYthing in my entire shop!